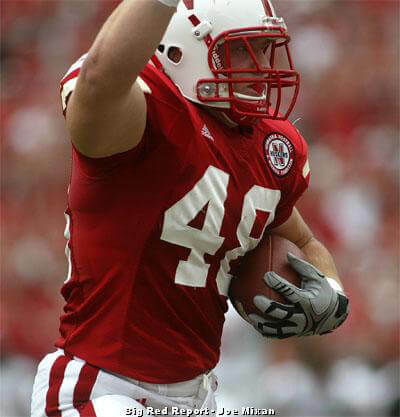 Some Huskers were pulling for Wisconsin when it played Michigan State the week before Michigan State came to Lincoln. But Tyler Legate wasn’t among them. “I was hoping for a good game,” the senior fullback said on the Monday after. A Wisconsin victory would have helped Nebraska in its quest to win the Big Ten’s Legends Division and play in the conference championship game at Indianapolis on Dec. 3 because Michigan State and Nebraska are divisional rivals. However, regardless of the outcome of the Wisconsin game, said Legate, the Huskers would still have to beat Michigan State, which, of course, they did in impressive fashion. Usually, Legate doesn’t pick one team over another, but when he does, “I like to see the underdogs win, I guess. I’ve always been like that, ever since I was a kid,” he said. It would stand to reason, then, that Legate might side with Iowa against Michigan State on Saturday. The Hawkeyes figure to be slight underdogs, even though the game is in Iowa City. Legate was asked on Monday if he would be cheering for Iowa. “Yeah, I guess,” he said. There’s more to his answer than Iowa’s being an underdog, however. In the wake of their 28-25 upset loss to Northwestern on Saturday, the Huskers no longer control their own destiny. “Happy Valley,” home to Penn State, is far from happy these days, what with the ugly scandal allegedly involving former Nittany Lions defensive coordinator Jerry Sandusky. Despite the distraction, however, Penn State is atop the Legends Division with an 8-1 record. So it figures to be a formidable foe. What a difference a week makes. Now Michigan State is a game up on Nebraska in the division race with an ostensibly weaker schedule than the Huskers face from here on out. Still, Nebraska has the tie-breaker with Michigan State, so the Spartans would need to lose only once – if the Huskers were to win their final three regular-season games. Nebraska, 3-2 in the Big Ten, is 7-2 overall. “The rallying cry is we want to win 10 games,” said offensive tackle Jeremiah Sirles. “If we can win 10 games, that’s usually a pretty successful season. The Huskers are in control of the first and third parts of the Sirles scenario, winning 10 games and winning a bowl game. But the Indianapolis part depends on someone else. And again, that someone could be Iowa, against whom Nebraska finishes in Lincoln on the day after Thanksgiving. “It’s a three-game season, so just take it one game at a time and see what happens,” Legate said. The Huskers play the other divisional contender, Michigan, in Ann Arbor next week. So by winning out, they could eliminate all of those competing for the divisional title except Michigan State. If the Spartans don’t lose to Iowa, Nebraska would have to get help from either Indiana or Northwestern. Of course, there are other scenarios even if the Huskers lose again. But those are extreme longshots. Quarterback Taylor Martinez was philosophical about the situation on Monday. Nebraska has to “take each game one at a time and everything else will fall in place,” he said.